In this tutorial, we’re going to look at how to create tabs in HTML, CSS and jQuery. If you get stuck, don’t hesitate to ask me a question. Tabs are a great way of grouping lots of content into a very small space. Think of tabs like the TARDIS…bigger on the inside. They can be incredibly handy when you have a lot of content that would simply fill up your page with too much information in one go. You might also like: Creating an Accordion with HTML, CSS & jQuery. I go into detail on the specifics of the HTML layout below. Starting off there’s a div with class="tabs". Inside there’s an unordered list, (or an ordered one if you like, it makes no real difference), with class="tab-links". Inside the list items there are anchor links. The first list item is marked as class="active". This indicates where to start the tabs. Note: When the CSS is all done, the tab link parent with class="active" will be the highlighted one on page load. There’s a div with class="tab-content". Inside of that, we have 4 divs, each with class="tab", (this number corresponds to how many tab links there are). The currently visible tab will also need an active class, e.g. class="tab active". I’m going to keep it simple with basic CSS (as opposed to an SCSS pre-processor like Sass, Less or Stylus). The bulk of this tutorial is aimed at beginners, so I’m taking that into account. I go into detail on the specifics of the CSS styling below. The display:inline-block; adds a type of clearfix while also making it more ‘stable’ than if we used display:block;. The reason we use a clearfix above yet not here is as follows: display:inline-block; sometimes adds 7px-ish of margin below the affected element with no way of removing it. Sometimes using a minus bottom margin works, but it depends heavily on how your HTML is structured. In this instance it’s fine. We declare no list-style to stop it appearing as a default list. Then the margin so the links are spaced evenly apart, (using margin:0px 5px; is the same as using margin:0px 5px 0px 5px;). These are all basic styles which you should understand if you’re attempting this tutorial. If you don’t, please find the proper values and the definitions for each on the CSS-Tricks Almanac. You may be wondering why I’ve used transition:all linear 0.15s; instead of transition:background linear 0.15s;. The reason is simple, in my experience, you have to think ahead. If you don’t then nasty, (sometimes hard to fix), bugs pop-up seemingly out of nowhere. By using background instead of all, we’d be limiting what can be transitioned on the :hover effect. Since this is a tutorial, many of you may want to change the text colour on hover. By using all instead of background that makes it possible. This is the background of the tab content section. We set all tabs to display:none; which hides them. Then we set the active tab to display:block; so only that one will show up. It’s a simple case of using CSS the way it was designed, which was to cascade down. Hence the name, Cascading Stylesheets. Below you can see the completed jQuery code. Keep scrolling for a good explanation of how it all works and what it all means. Let me clarify something before we start: Everyone has their own way of coding, with jQuery this is mine. Writing it out like this makes it easier for a beginner to grasp, it’s also efficient. Next is to check if the user has clicked on a tab, to do that we simply reference every link that happens to be a tab link with .tab-links a. Next, we create a variable called currentAttrValue, (current attribute value), which grabs the href="" of the clicked anchor link. We need a way of matching up the .tab-link anchors with .tab sections. We start off by referring to the entire tabs component, with .tabs, then we say “If .tabs has a child with an #id that then matches a .tab-link href="", then they should be linked up”. Then we say “Show the element with the referenced #id, such as #tab2, then find the other tabs, which are siblings of #tab2, and hide them”. Changing the active state of the tab link is relatively the same as showing/hiding the tab content. First, we look for jQuery(this), which is the current anchor link being clicked. Then we find it’s parent list item with .parent('li') tag. After that, we give that parent list item a class of .active by using .addClass('active'). Lastly, we find all siblings of that parent list item and remove, if any, classes of .active by using .siblings().removeClass('active'). You may notice that when you click an anchor link with an #id specified instead of an actual URL, it tends to add the #id into the address bar. E.G. http://sebkay.com becomes http://sebkay.com/#id. This can be a massive pain-point for users when trying to click the back button. This handy little function stops the default action of the clicked element from happening. Remember when we put that function(e)at the start of our click event? Well, this is where that ties in. You may not like the way it just jumps to the new tab content without any nice animation of any kind, well here’s some extra credit. To apply these changes simply replace the below snippet with the other code snippets that follow. If you’re reading this conclusion, (most people, including me, tend to leave after they’ve got the code they were after), then please leave a comment below with any problems or bugs regarding this tutorial. I’m writing this to help people learn and become the best they can be. You might also like: 21 Must-Have Front End Development Tools. How can I switch through the tabs with buttons? I wasn’t quite accurate in the first post, there is a second ajax call that loads the tabbed results created from a db query. I can just hard code it at the bottom of the html and it works, but if I send the exact same html back from an ajax call it doesn’t work. It seems ajax and tabs just won’t play together, the best you can do is to use ajax to fill an existing tab. Unfortunately I need to create the tab set on the fly and send the complete html, which from everything I’ve read, can’t be done, even using jquery tabs or jquery tab plugins. Is this not compatible with jquery ajax? I have a page that is php generated and uses jquery’s ajax post to load a chained select, the page works fine locally and in jsfiddle, and on the server, but as soon as I generate it from a php script it doesn’t work. I can even save the output as an html page and the tabs work. The only things different in the php version are a couple of included php functions and the ajax call from the first select. I’m using your js file from the demo page and I’ve even copied out the standard tab demo and pasted it directly to bottom of the html page to be output, and that won’t work from the php page either. But if I save that same output as html they all work. I’m stumped and I’ve wasted 4 hours on this already, I am open to any thoughts or suggestions you might have. CAN U SUGGEST ANY STUDY MATERIEL. One more help I need. I am trying to create drop down with checkbox in its every option using jquery. Instead of crating multiselect drop list this is my requirement. Can you please help me with this?? Really helpful post. But I have a requirement where by on button click my first tab should take me to the next tab. could you please suggest ? It was an easy mistake to make. The problem was a typo. Instead of the code saying $(this).attr('href'); it said $(this).attr('herf');. Notice the use of herf when it should be href. I have tried the same design. And tab content is not changing. I have tried all the suggestion posted below but still not working. The tabs are set up in a way that only the tabs can change the content. If you would like, I can post a JSFiddle on how to modify the code? Hi Seb, thanks for your great and usefull tutorial. Where I have to modify in order to have a button to go to the next tab instead of press “Tab #2” or “tab #3″… ??? Could you please help me,I’m kinda stuck here. Neither my content is changing,neither is the active Tab. All you need to do is remove the class of standard in the jQuery. So $('.tabs.standard .tab-links a') becomes $('.tabs .tab-links a'). I’ve updated the tutorial in regards to this. If I change the <base to the page with the tabs, I have to change all the links in my cms to the graphics, scripts etc. I also tried: https://code.jquery.com/jquery-1.11.0.min.js and linking it directly to the file: src=”js/bbfTabs.js” , neither seemed to work. This link should work: http://jsfiddle.net/jhannah1357/9upv6/. I also tried: and linking it directly to the file: , neither seemed to work. The link to the jsFiddle you posted didn’t seem to work. Could you check it? Thanks for the tutorial. I am having a problem though. When I click the tabs they do not become active and the content remains the same (tab1). I thought I had missed something in the programming, so I copied the tutorial files directly into JSFiddle ). I still could not get it to work, what I’m I missing? What’s the purpose of ‘after’ in this line .tab-links:after in your CSS? Hi Roy. The first part that goes '.tabs ' is simply refering to the parent container. I like to be a little more specific with my jQuery than some people but you are also correct, it will work without the '.tabs '. Hi Mark, the code you posted seems to work fine (I copied it into JSFiddle to make sure). Have you double checked the jquery file you including jquery.js is being included properly and is the latest version of the jQuery library? It may be in a folder, like js/jquery.js. Hi Seb, thanks for your fixed code. It work well but when I put it into my html/js file and try to run, this code don’t work (of course, I put html and js file together in a folder). I copy my files to Pastebin. The problem was a few things. The first was that jQuery wasn’t being included properly. Hi Sam. That sounds like a good idea. This site is made with WordPress and the comments area is custom coded. Hi Seb, this is my code: http://jsfiddle.net/markstevens/DDV98/1/ . I am new with js and jquery, may I wrong at somewhere in my code, I hope you can fix it and point out what I do wrong. Thanks. Hi Mark. The problem is most likely not adding the class of ‘.active’ to the first tab link and first tab content section when the page loads. 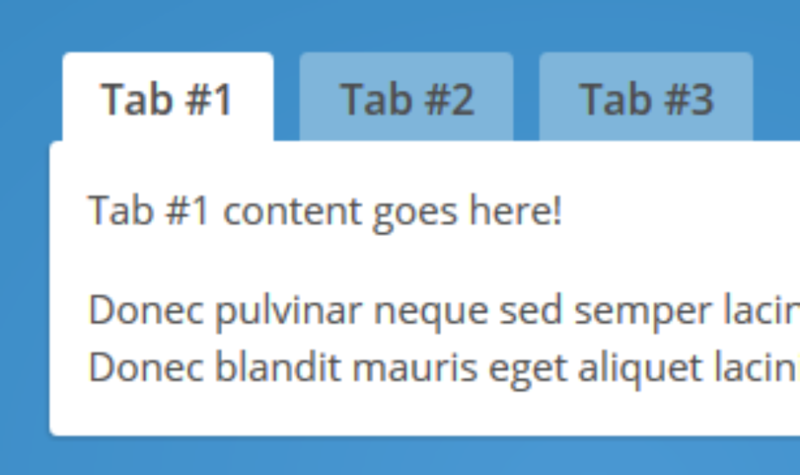 Hi Seb, I followed this tut, but when I move from tab to tab, content of the tab isn’t change , it always keep content of Active tab. So, what can i do to content of the tabs can change. Hi, the best place to put the jQuery code is in a separate file and then include it into the page with a script tag. where can I add jquery code? Can you give me a little more information or post a http://jsfiddle.net/ of your code?